JBL Charge 4: Is it any good? What are the best alternatives? | What Hi-Fi? JBL Charge 4: Is it any good? What are the best alternatives? JBL makes some excellent wireless speakers but which is the best deal? JBL is the figurative king of wireless Bluetooth speakers. The popular US brand has hoards of wireless speakers ranging from super-cheap to feature-packed, portable to boombox models - and every one we’ve reviewed has bagged either a top-honours five-star review or a very commendable four stars. So JBL are a pretty safe brand to buy into. But should you buy JBL’s recently introduced and already-very-popular Charge 4 (£157/$129.95)? Or might a popular alternative serve you better? How about the smaller, cheaper Flip 4, more powerful Xtreme or Boombox, or the dinky Clip 3 wireless speaker? If you're considering the Charge 4, read this guide first to work out if it's the best wireless speaker for you. JBL Charge 4: Should you buy it? 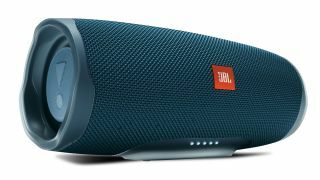 JBL launched the fourth generation of its Charge wireless speaker last summer, and it’s as well specified as you’d hope for for the price. Dual external passive radiators and a proprietary developed driver kick out 30 watts of power, and a 7500mAh battery offers 20 hours of playback from a single charge. The Charge 4 can charge a smartphone or tablet through its USB connection, is waterproof to IPX7 (meaning its can be immersed in up to one meter of water) and has a 3.5 mm audio cable input, allowing you to connect older music devices. It’s also compatible with JBL Connect+, meaning you can connect other JBL speakers (up to 100 compatible JBL speakers, in fact) for simultaneous playback. Two smartphones or tablets can connect to the Charge 4 at the same time, too. And like almost every JBL wireless speaker, the Charge 4 comes in more colour finishes than you could comfortably eye up in one glance. We haven’t yet put the Charge 4 to the test, but if the Charge 3 is anything to go by, there's every possibility it could be a class leader. We praised the Charge 3 for its “rugged and sturdy build”, “weighty and extremely powerful” sound and “useful features”. Considering JBL has worked to advance the sound and feature specs in the Charge 4, there's reason to believe it will be an even better proposition. Short answer: With its array of features and its predecessor’s success on its side, the Charge 4 is a wireless speaker we wouldn’t hesitate considering for those after a well-built, portable wireless speaker. It's ideally-sized to carry from one room to another, and has a generous battery life that won't need topping up too regularly. On paper, it certainly sounds the part. Naturally, when a new model comes along, its predecessor drops in price - as is the case here. The Charge 3 is currently £89.99 in the UK and $88.50 in the US - a good deal cheaper than the £157/$129.95 Charge 4 price, then. So should you buy the Charge 3 or the Charge 4? Most of the Charge 4’s features above are present and correct in its predecessor, although unsurprisingly it’s slightly less well equipped - the Charge 3 has a 20-watt output, 6000mAh battery and only dual external passive radiators. It does pip the Charge 4 with a speakerphone for taking calls, however. Both are good options, but ultimately which one you go for depends on how willing you are to pay a premium for a boost in usability and, most likely, performance. JBL Boombox, Xtreme, Pulse, Flip and Clip? Of course, there are plenty more JBL Bluetooth speakers, both new and old, to consider. Most (not all) of the signature JBL features, such as JBL Connect+, the waterproof design and the 3.5mm audio input, span several models, but each speaker justifies its existence with a unique twist to its specs. The current Flip 4 ($74 / £79.99) won't be the latest model in the Flip range for long – at CES 2019, JBL announced the Flip 5 for a spring launch. That said, this Flip will undoubtedly be around for some time, and likely at a good price too. The Flip 4 sits just below the Charge 4 in the JBL line-up, and despite being smaller is fairly similar in design. It offers only 16 watts of power and a 12-hour battery life, though, and can’t charge your smartphone or tablet either. It can simultaneously connect to two phones as music sources, is waterproof to IPX7 standards, has a 3.5mm jack and supports JBL Connect+. It also has speakerphone functionality and offers direct access to both Siri and Google voice assistants. As for the performance, it exceeds volume expectations and has plenty of weight and scale, although we hanker for a touch more clarity and dynamism – the UE Wonderboom pips the Flip 4 in these areas. Overall the Flip 4 is a good portable speaker - intuitive to use, with pretty solid sound quality, and small enough to slip into the side pocket of any rucksack. The Flip 3, its predecessor, can still be found online, and offers a great deal of the Flip 4’s features at a cheaper price ($62.99/ £49.99) - it just forgoes Connect+ and has a 10-hour battery life instead. Above the JBL Flip is the JBL Xtreme ($149.99 / £129), another popular model, ideal for anyone after a more powerful and room-filling sound who can house a slightly larger unit. After all, compared to its smaller siblings, it's something of a brute! The original Xtreme has a 40-watt output, can wirelessly connect up to three smartphones or tablets, and can charge devices via dual USB ports. It offers 15 hours of playtime, a speakerphone, a splashproof design and JBL Connect. "A versatile wireless speaker with which you can certainly have a lot of fun", as we said in our five-star review, the Xtreme wins our affection with its full, large-scale and dynamic sound, and solid, chunky build. The newer Xtreme 2 is largely similar but brings some of those specs up to date with JBL Connect+ and an IPX7 waterproof build. It is $219 in the US and £258.62 in the UK. And that makes the half-price original Xtreme all the more tempting. The current Pulse 3, meanwhile, is a unique offering, arguably more of a party-crowd pleaser than any other JBL speaker with its 360-degree sound and ‘light show’ feature. The Pulse 3 offers many of its siblings’ functions (simultaneous connectivity up to two devices, JBL Connect+, IPX7 waterproofing, 3.5mm audio input and speakerphone), however uniquely it can light up with the music thanks to built-in LEDs. Oooh. It offers up to 12 hours of playtime with music and light show. Almost top and tailing the JBL wireless speaker line-up are the Boombox and Clip speakers, respectively. The Boombox is an all-singing-all-dancing, well, boombox! At 50cm long and weighing around 5kg, this Bluetooth speaker is the largest and priciest single-unit speaker in the company's line-up. It's a real monster, with four active transducers and two bass radiators pumping out 60 watts of power. Battery life is a class-leading 24 hours, and every feature talked about above is present and correct. While we'd say the Flip, Charge and Pulse models are more than suitable for moving around the house for bedroom, kitchen or bathroom listening, the Boombox really is a more serious, heavy-duty proposition. The palm-sized Clip 3 really is an on-the-fly-only option for when you want something slightly better and louder than your smartphone speakers. But it's ideal to throw in your suitcase for a holiday or for a child's bedroom. It still boasts a respectable 10 hours of playtime, is IPX7 waterproof certified and has a 3.5mm input jack. Of course, while JBL is a reputable wireless speaker brand, it isn't on its own. Ultimate Ears (often shortened to UE) is behind some of our favourite budget, portable models, so if you'd rather stick to proven winners, the below may be of greater interest. The UE Wonderboom ($59/£59) and Roll 2 ($69/£64) (pictured above) models are our tried-and-tested picks for those on a very tight budget. Ideal travel companions, they impress with their great-value sound, long battery life and Bear Grylls levels of durability, making them fantastic alternatives to the JBL Clip 3 and Flip 4. Got a little more money to spend? Go for the UE Megaboom 3 ($179.99 / £114), which offers more than the latest UE Boom model for not much more cash. Last but not least, we'd hugely recommend considering Audio Pro, who in the last couple of years has made a bigger mark in the wireless speaker market than any other brand. The biggest selling point of their wireless speakers is sound quality, which in our experience topples its competitors at nearly every price point they cover. They also all work in a multi-room capacity over wi-fi too, and they tend to expand upon Bluetooth and 3.5mm connectivity with Apple AirPlay and streaming service support, such as Spotify Connect. They're much more than just Bluetooth speakers, then, so if you're partial to their mostly box-like design, can afford their price tags and are after multi-room features in addition to Bluetooth, Audio Pro's offering should be considered. Our favourites? The Audio Pro Addon C3 is a current What Hi-Fi? Award winner and packs all of the features mentioned above for $299 / £199, plus a 15-hour battery life and Alexa voice control when used with Amazon Music. More affordable options are the Bluetooth-only, mains-powered Audio Pro Addon T4 in the US ( $99) and the T5 in the UK ( £99).